"Great Things Have Been Effected by a Few Men Well Conducted"
In February of 1779, a group of 170 men marched with urgency across the fields of Southern Illinois. 26-year-old Lieutenant Colonel George Rogers Clark had just been alerted by merchant Francis Vigo that British forces had taken over Fort Sackville in Vincennes, thus gaining a crucial foothold in the Revolutionary War's western front. In order to take the fort's British inhabitants by surprise, he would have to lead his small force of frontiersmen on a 157 mile journey in the dead of winter. Braving an unexpected thaw that drenched the fields in freezing water for more than half of their expedition, the group arrived in Vincennes on February 23rd and forced the British to surrender Fort Sackville two days later. But this victory didn't just help turn the tide of the war. Its strategic placement opened up the area between the Ohio River and the Great Lakes to American settlers -- a movement that made it necessary for the British to relinquish the land as part of the 1783 Treaty of Paris. The creation of the Northwest Territory provided a blueprint for the establishment of states in addition to the 13 original colonies, perfectly setting the stage for 1803's Louisiana Purchase. Today, in Vincennes, Indiana, a monument to the events of February 1779 stands in the form of George Rogers Clark National Historical Park. Sitting on the land that once held Fort Sackville, the park's rotunda features a massive bronze statue of the man whose actions ultimately resulted in the establishment of the American West. And now, George Rogers Clark's landmark mission is part of the United States Mint's America the Beautiful Quarters® Program -- and you can bring it home to your collection, struck in five ounces of stunning silver! ILLUSTRATIVE, INSPIRING DESIGN . . .-- This last America the Beautiful Quarter release of 2017 features the work of designer Frank Morris and sculptor Michael Gaudioso. This design dramatically captures George Rogers Clark as he leads his men through the cold and waterlogged Southern Illinois plains. 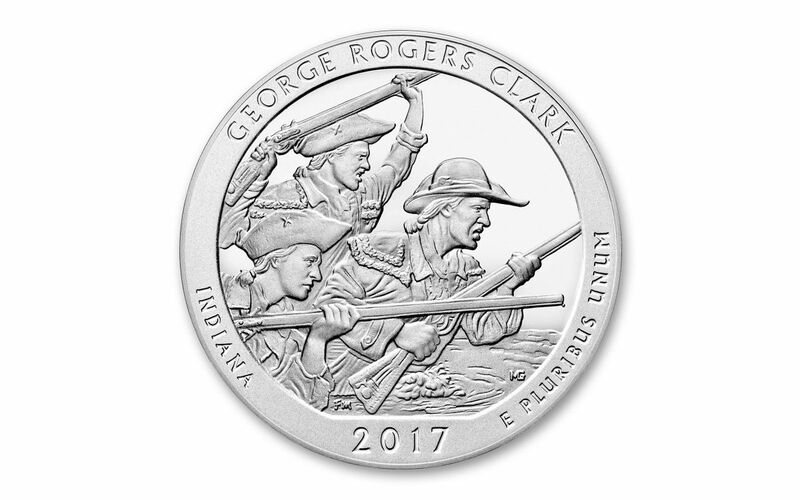 GORGEOUS BU CONDITION-- Your 2017 5-oz Silver George Rogers Clark Bullion Coin will arrive to you in Brilliant Uncirculated (BU) condition, exactly as it left the Philadelphia Mint. A COLLECTORS' FAVORITE SERIES! 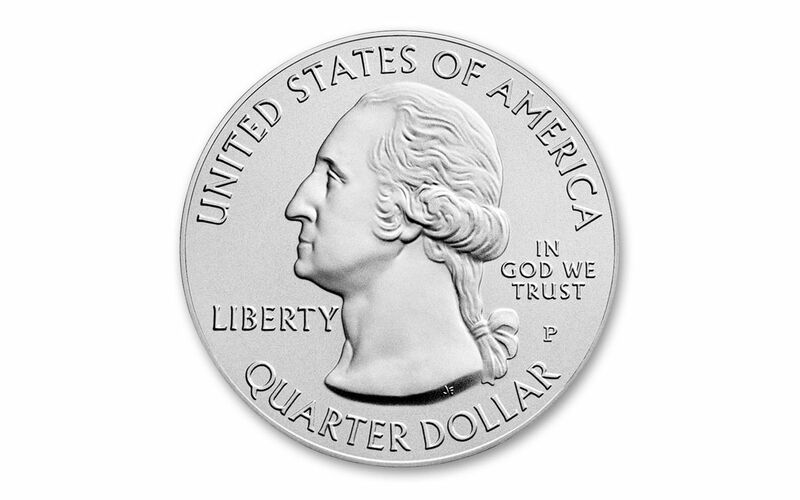 -- This fifth and final America the Beautiful Quarter release of 2017 continues the popular series, first established in 2010 and still attracting new collectors to the fold! This gorgeous coin is a perfect tribute to the spirit and bravery that helped found and grow the United States of America, as well as an ideal addition to your collection! 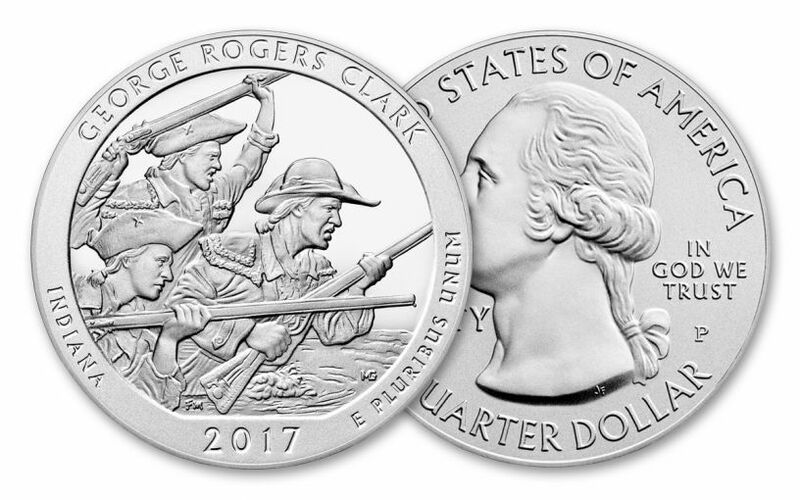 Capture your own 2017 5-oz Silver George Rogers Clark Bullion Coin today!